If you didn’t know it was there, it would be easy to miss the 1st Stage Theater. The entrance is at the end of a long walkway over a garage and a new salsa/bachatta nightclub at 1524 Spring Hill Rd. 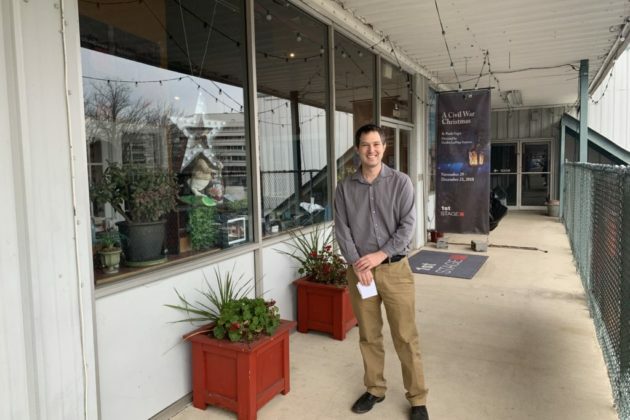 But despite the humble appearance, for the last ten years has held the distinction of being Tysons’ only professional theater and one of the few arts venues in an area that can sometimes seem like a cultural vacuum. Like the rest of Tysons, 1st Stage Theater has been finding an identity and working through growing pains. The theater’s director, Alex Levy, took over the company four years ago. From the moment he walked in, Levy said he was in love with the location. Levy said the black box theater offers a large enough stage to produce shows of a grand scale, but is also close enough to its audience for a level of intimacy. But for the region, Tysons is still the frontier when it comes to arts and culture. “It’s great being part of the [Washington D.C.] theater community, but it’s a challenge being at the edge of that,” said Levy. Levy, who had previously worked in theater in Los Angeles, New York, and Chicago, said that before he moved here, there were people who tried to warn him away. According to Levy, the theater has been growing in attendance by 15 percent year after year, but that’s starting to have its own challenges as well. Some of those constraints have become most palpable with the theater’s most recent production. Last week, “A Civil War Christmas”, directed by Deidra LaWan Starnes, opened at the theater. With a cast of 12 actors playing 48 characters, the play is ambitious for a black-box theater without any wings and a dining-room sized green room. “We need better rehearsal rooms, we need more bathrooms, and we would love to be in a more high visibility area,” said Levy. 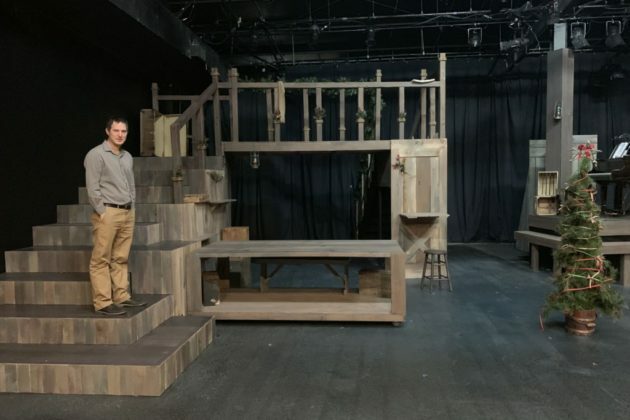 The theater has made some expansions, like a new rehearsal space they moved into next door to the black-box theater that allows the company to rehearse the next play while one is still being performed. There’s also costuming and storage space, but these are short term fixes for what Levy recognizes is a longer term challenge of the theater’s location. But Levy said the script, written by Pulitzer Prize winner Paula Vogel, about disparate people coming together in a time of strife, was a message he thought was very relevant. Despite the challenges the scope of the play presented, Levy said he felt it was important for the theater to attempt. “One thing that we always ask is ‘What does it mean to do this show at this time and this place? '” said Levy. Next year, the 1st Stage Theater’s season is scheduled to continue in the spring with “The Brothers Size,” a play by life on the bayou by Tarell Alvin McCraney, the writer of “Moonlight.” Later that year, the company is scheduled to perform “columbinus,” a play about the Columbine High School shooting. A “Civil War Christmas” also faced another challenge the week before its opening. 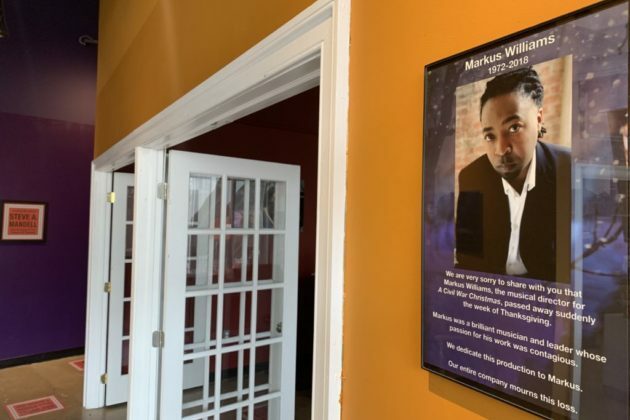 Markus Williams, the musical director for production, died on Monday the week before opening night. The cause of his death is still being determined. There’s a photograph of Williams with a plaque honoring him in the lobby.